Samsung 7 Inch Tablet Appear on the Internet will become the Successor Xoom? Appears an apparition photograph tablet that is used will be the successor to Motorola's latest tablet of Xoom. No official information regarding the name of this tablet. But certainly this tablet has a 7 inch screen and has a shape that is thinner than 10 inches Xoom. Moreover, this tablet will be information on the market in February next year. 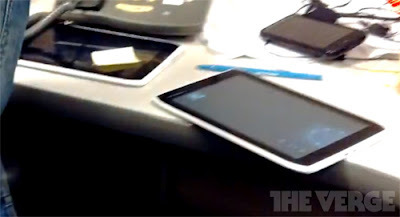 Regarding the OS, these tablets using the Android OS. But Android is not too clear what it is used. In addition there is also a micro USB port and HDMI micro.